Product prices and availability are accurate as of 2019-04-24 11:24:50 UTC and are subject to change. Any price and availability information displayed on http://www.amazon.com/ at the time of purchase will apply to the purchase of this product. Looking for a Perfect Gift? No further need to look, here are 9 of the best gift choice from Cooko All your needs are here: 1. Foil : Use the foil cutter to take out the wine foil and prepare for the next opening. 2. Corkscrew: Simple open your fresh wine with our Premium corkscrew opener 3.Collar: It can avoid the wine leak out ,when we pour with collar around the neck of the wine 4. 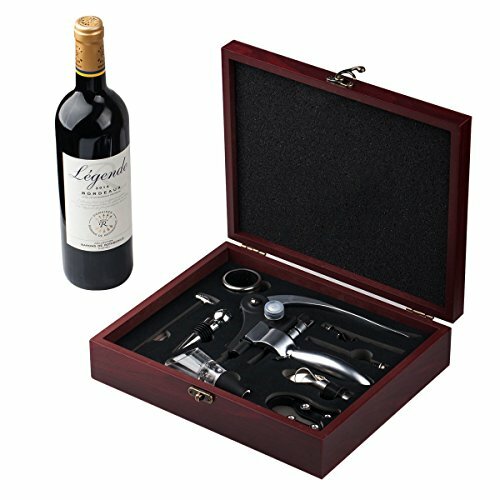 Wine pourer& aerator: Use the wine pourer or wine aerator for better precision, 100% drip free experience 5. Wine stopper: Some wine left? No worries use our high quality wine stopper; it will maintain the wines quality & taste. Next time you wane enjoy your wine it will taste just like the first glass after you just opened the bottle. 6.Thermometer: We know the wine taste better when the temperature is 16-18 degree ,with a thermometer we can better know the time to drink or store. 7. 2 Extra screw: When we have found the screw is not enough sharp ,we can use them to replace the original corkscrew,it is so exciting. 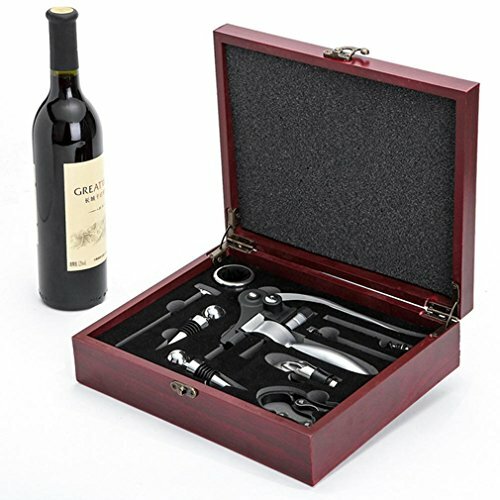 Perfect for all wine enthusiasts, the Corkscrew Wine Opener Wood Box Set offers effortless, self-pulling action and a strong, non-stick coated screw that will not damage corks. Don't hesitate,you can order now for your family or friends. NOTE: The wine on the picture is not included in the package, It is only used for product showing.